Every administration since Reagan has gotten tougher on mergers. Obama tops them all. 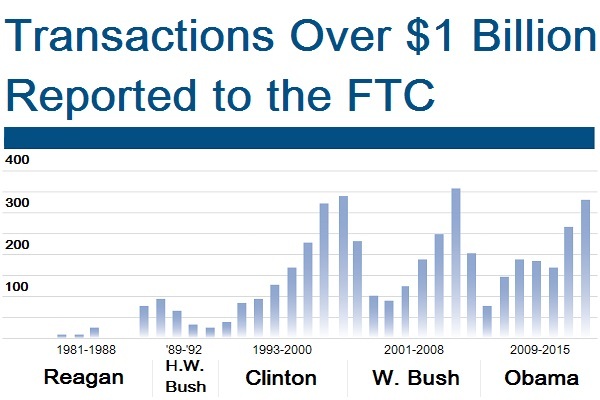 Using data from the FTC, TheStreet has discovered how big government is flexing its antitrust muscles. On April 6, the Department of Justice filed a lawsuit to block Halliburton's (HAL - Get Report) proposed $35 billion plan to acquire Baker Hughes (BHI after a 17-month antitrust review. Harsh words from Attorney General Loretta Lynch and her antitrust chief, Assistant Attorney General Bill Baer, against the merger that day were aimed not only at the two companies and investors pushing that merger, but dealmakers in general, too, many of whom the officials said are instigators of an ongoing a wave of mergers in already concentrated industries. Lynch, before lawyers attending the American Bar Association's spring antitrust meeting, warned of "an unprecedented swell of mergers coursing through the U.S. economy," adding, "It isn't just the number of proposed deals that makes this a unique moment in antitrust enforcement; it's their size and their complexity." Not only are U.S. regulators grappling with a boom in mergers, many global in scope, but they are also engaging in some of the toughest merger enforcement in decades. Using data from the Federal Trade Commission and The Deal, a subsidiary of TheStreet.com, TheStreet has discovered a pattern of increased regulatory actions challenging mergers that dates back to the Reagan administration. 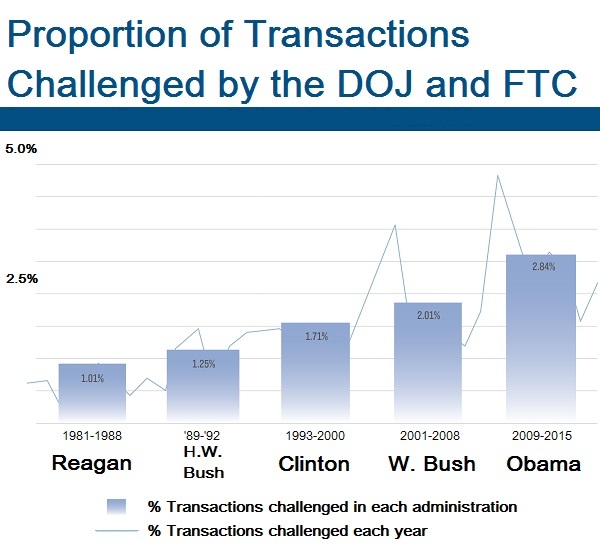 Under President Obama, the FTC, DOJ and other regulatory bodies have challenged and blocked a higher proportion of U.S. deals than ever before. At the same time, deals are getting bigger and more complicated. 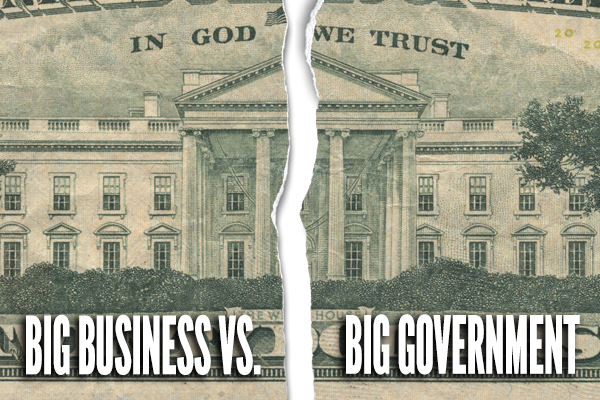 Call it "Big Business vs. Big Government." 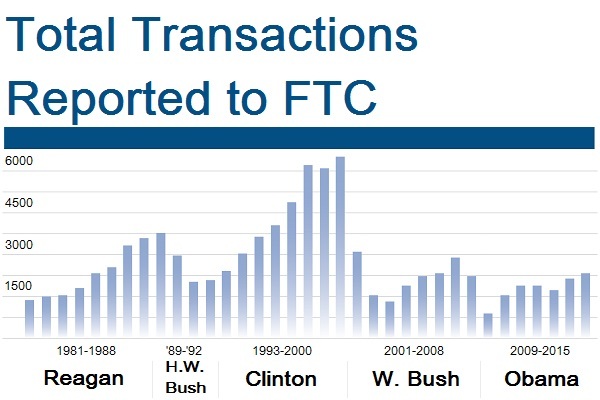 In 2015 alone, the DOJ and its sibling antitrust agency the Federal Trade Commission challenged 47 mergers, which ultimately resulted in a lawsuit seeking to stop the deal, abandonment of the transaction by the companies or in a restructuring of the deal to address antitrust concerns. That's an increase of more than 40% from the 33 deals challenged in 2014. A look at The Deal's data on transaction over $3 billion show a similar aggressiveness. In 2015 alone, five of these mega deals were abandoned up from two in 2014. Although merger challenges stepped up measurably after Obama moved into the White House, the 2015 increase was dramatic even by the Obama Administration's track record. Lynch said the reason is because companies and their investors are pushing obviously anti-competitive deals in industries that are already highly concentrated. Often the deals can't be fixed with the most common antitrust remedy, which is to sell off assets in business units where the harm to competition is particularly acute. "A number of the proposed mergers that we have recently reviewed plainly ran the risk of distorting markets and harming the public interest," she told the ABA crowd. "Some of these deals were so obviously anticompetitive that they were doomed from their inception." Merger activity spiked in the years after the Reagan administration relaxed regulations and during the dot-com boom of the late 90s. Source: Hart-Scott-Rodino Act filings with the FTC. Although the past year has seen a dramatic jump in merger reviews, The Street's analysis of government data show the level of antitrust enforcement has been slowly rising since the end of Reagan administration, which ushered in monumental deregulation following The Gipper's election in 1980. In subsequent administrations over the past 36 years, both Republican and Democratic presidents have overseen an ever-growing willingness on the part of the government to challenge merger transactions. Deep Dive: Will the Next President Be as Tough on Mergers and Acquisitions as Obama? The raw number of transactions challenged by regulators has fluctuated based on number of deals reported and how aggressive enforcement has been. Source: Hart-Scott-Rodino Act filings with the FTC. When it comes to big mergers, the numbers are even more dramatic. In 2015 there were 67 proposed mergers were valued at more than $10 billion -- more than double the annual volume in 2014, according to numbers from testimony of the DOJ's Baer before the Senate Antitrust Subcommittee in March. In 2015 there were 280 mergers valued larger than $1 billion, he said. According to The Street's analysis that's also more than double the level from 2010, when there were 124 deals over $1 billion. Transactions are getting bigger and more complex. Source: Hart-Scott-Rodino Act filings with the FTC. That's a lesson Halliburton and Baker Hughes are having to face now. Sources familiar with the discussions said Halliburton attempted to reach a settlement with the DOJ by pushing sales of the various oil production lines that it would have to shed to multiple buyers. But sources outside the company had speculated that the DOJ would insist on a single primary buyer in order to create a competitor large enough to replace the competition lost with the elimination of Baker Hughes as a stand-alone company. Deep dive: Will the Halliburton-Baker Hughes Deal Survive Government Opposition? "We have learned to be skeptical of settlement offers consisting of behavioral remedies or asset divestitures that only partially remedy the likely harm," according to Baer's written testimony to the subcommittee. "We will not settle Clayton Act violations unless we have a high degree of confidence that a remedy will fully protect consumers from anticompetitive harm both today and tomorrow. "Where complex transactions pose antitrust risks in multiple markets, our confidence that Rube Goldberg settlements will preserve competition diminishes. Consumers should not have to bear the risks that a complex settlement may not succeed." Antitrust lawyers say a number of factors have contributed to the aggressive stance the Obama administration is taking today. For starters, Obama himself pledged to be assertive on the merger front during the 2008 election campaign. At the tail end of Bush's second term, merger enforcers had developed a reputation for giving mergers an easy ride, largely because DOJ's approvals of the Whirlpool-Maytag merger in 2006 and the combination of XM and Sirius in 2008 without any conditions. But a more apt characterization would be of regulators struggling to wage successful litigation after a string of high-profile losses, including courts' rejection of the DOJ's and FTC's attempts to stop the 2001 acquisition of Comdisco by Sunguard Data, Arch Coal's 2004 purchase of Triton Coal and Oracle's acquisition of PeopleSoft that same year. 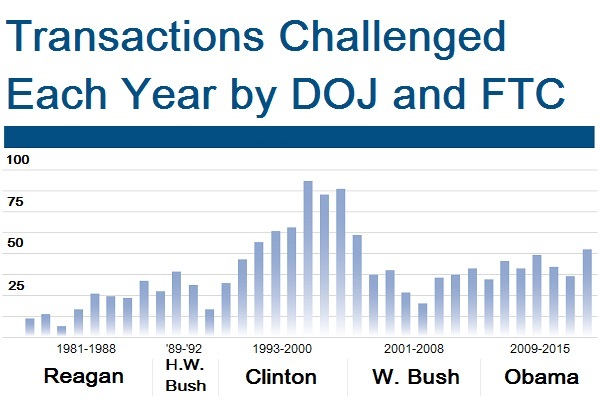 During the tail end of the Bush years, the agencies were examining how to improve their performance in court, and when Obama took office the career staffers who continued in their jobs were ready to act, bolstered by the White House's decision to hire additional experienced litigators. And act they did. The effort paid off in 2011 with the DOJ's successful court complaints to stop H&R Block's attempt to take over rival TaxACT, and AT&T's bid to acquire T-Mobile USA. Those successes invigorated the agencies' willingness to fight mergers in court and led to fruitful challenges against US Airways Group's purchase of American Airlines, which resulted in a divestiture of slots and gates at key airports; Bazaarvoice's acquisition of online ratings rival PowerReviews; Anheuser-Busch InBev's purchase of Grupo Model SAB de CV, leading to another major divestiture; and the FTC's forcing a settlement on Ardagh Group's purchase of Cie. de Saint-Gobain's North American glass-container business. The maverick theory had its first big success in 2012 when the DOJ convinced a federal judge to halt H&R Block's proposed $287 million acquisition of TaxAct, an upstart, low-cost rival to the tax preparation company. The FTC proved it could stop a merger by arguing that it harmed a sliver of a larger market in the Whole Foods case. There the commission showed the deal hurt competition, even though there were plenty of traditional groceries, because it would diminish competition between grocers specializing in premium and organic foods. The FTC next showed the narrow market argument when it persuaded a federal judge in 2011 to stop Ohio hospital operator ProMedica Health System from integrating Toledo's St. Luke's Hospital into its operations because the merger would create a duopoly on obstetrics services. "There is greater risk tolerance [on the part of regulators] and that's why there's more litigation," said Sharis Pozen, who was a senior staffer at the beginning of the Obama White House and was elevated to acting antitrust chief after the departure of Christine Varney. Strong stands against big mergers look to be continued further into 2016. The FTC just wrapped its case before a federal district judge in its attempt to stop Staples's $6.3 billion bid to acquire Office Depot. Besides the now-pending Baker Hughes merger case, legal challenges are possible in other deals pending before the antitrust regulators, including Anthem's $54 billion plan to acquire Cigna and Aetna's purchase of Humana for $37 billion; Anheuser-Busch InBev's plan to acquire SABMiller for $106 billion; Dow Chemical's decision to merge with E.I. du Pont de Nemours and Co. and Walgreens Boots Alliance's planned $9.5 billion takeover of Rite Aid. Pozen, now vice president, global competition and antitrust at GE, said the administration's determination to revive the merger litigation was motivated in part because it wanted some of the new theories it was applying to merger reviews to gain the imprimatur of federal judges, which carries more legal weight than consent agreements reached solely between government agencies and companies. "People out there in the field we're telling us they were tired of 'soft law' and asking why aren't we seeing more litigation, why aren't we seeing our common law system working?" Going forward, antitrust lawyers said the government's aggressiveness isn't likely to dampen the corporate world's thirst for mergers. Deal volume is largely driven by the need for growth and more efficient operations, they say, and the government's policy is only one factor they consider. "When I look at the landscape of the interaction between government and business, I often find big business pushing for regulations that, while ostensibly good for the consumer, can only be afforded by big business," said TheStreet's Jim Cramer. "Large businesses, if they don't get their way, can move offshore rather easily. Smaller businesses? They just die. The government doesn't seem to be sensitive to that dichotomy at all." Perhaps a Republican White House will appoint more amenable merger enforcers but even under a Hillary Clinton or Bernie Sanders administration, the demand to carry out mergers will remain. The trick for acquisitive companies and their lawyers is to gauge what types of transactions a new lineup of officials will tolerate. "We have to be watchful and mindful of that and counsel clients as best as we can under the circumstances," Pozen said.